Sciblogs | Where do you fit on the scientific Kardashian Index? Where do you fit on the scientific Kardashian Index? 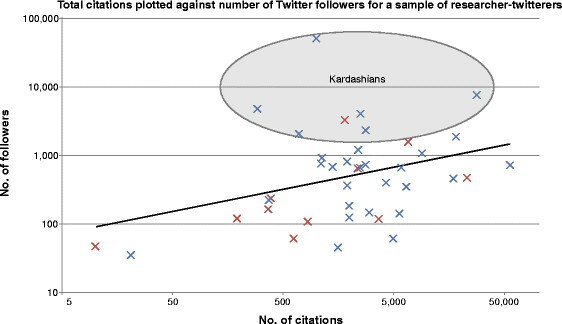 I’m a scientist who also owns a twitter account and was very interested in this paper by Professor Neil Hall from the University of Liverpool about scientists and Twitter and a new metric that he calls the Kardashian index. Where do you sit on the Kardashian Index? Basically it provides an equation so that you can compare the number of followers you have on Twitter with the impact of your peer reviewed journal publications, judged by the number of citations it has. It’s called Kardashian index based on Kim Kardashian being famous for not really doing anything, and thus those of us with a high Kardashian are classed as scientists who really haven’t accomplished much in science but talk like we do. It’s a great concept, and highlights the fact that scientifically we really are only judged as being successful by the number of citations we have, even if we do a whole bunch of other stuff around our discipline that makes a difference in other ways. The implication is that those of us who tweet apparently only do it to talk about how great we are. I disagree with this and only need to look at my academic peers to see that we use it for a multitude of things. I personally use it to interact with members of the public about science topics, and to link to educational science media work that I do so that people can watch or listen if they have an interest. I use twitter for many things, including showing that I’m a real human being not a science robot. I also post pictures of my dog, which has nothing to do with science, but hopefully shows that I too have a life outside of science and my dog is part of that! Professor Hall proposes that that those people whose Kardashian index is greater than 5 can be considered ‘Science Kardashians’. Naturally I calculated my own Kardashian index and am officially, according to this paper a Kardashian in science, however I do feel privileged to have come out with the same score as Brian Cox. I have to admit that I really don’t care, because one thing that Professor Hall doesn’t seem to include, is how useful Twitter can be for a scientist. It’s a great space to talk to other scientists, I’ve set up international collaborations through twitter, I’ve found out about funding opportunities through twitter. More importantly for me, I’ve been able to answer serious questions from the public about their concerns with topics in science and openly debate with other scientists hot topics in our fields. None of that creates a citation index number, most of it isn’t recorded or logged, but a lot of it is important in creating a community of scientific individuals that the public can trust and who can inspire others to follow through to a scientific career. The bigger question lies in the issue that the number of citations a paper has doesn’t indicate how many people outside of academia read it and quoted from it. It’s an internal mechanism that rewards people within the system, but at no point do we measure how many members of the public, whose taxpayer money may have been used to fund the research read and understood the significance of the research and thus lies the issue with how me measure success as a scientist. 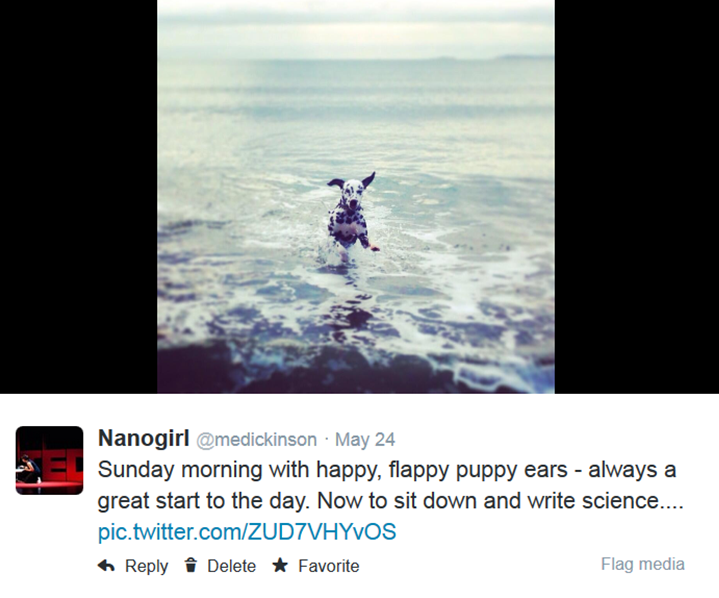 It’s a dilemma I have daily as a passionate scientist who loves the science that I do, but who also loves to communicate it with the outside world. The system currently only rewards number of publications and number of citations, and so if I were worried about career progression or being a ‘successful’ scientists, then I would quit all of this blogging, tweeting and media stuff and only concentrate on outputting peer reviewed papers.